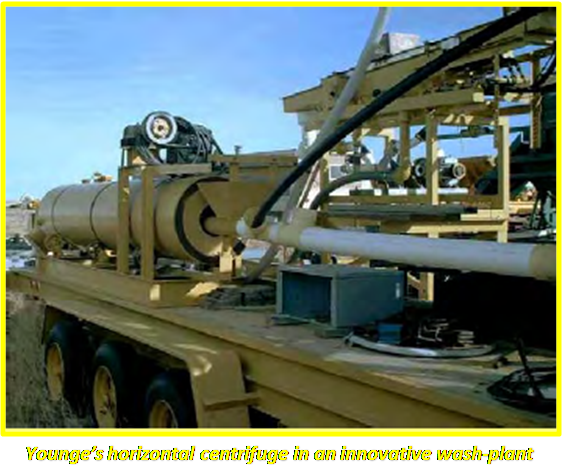 Younge’s horizontal centrifuge was invented by EarlG. Younge of Langley in British Columbia for which he was granted patents in Canada in 1981 and 1983 (CA #1,110,206 and #1,153,336) and similar patents in the USA in 1981 and 1982 (US #4,265,743 and #4,347,130) entitled ‘Method and Apparatus for Extraction of GoldFrom Placer Gravel’ and ‘Placer Mineral Concentrator and Process’. In this account the device is termed a horizontal centrifuge to clarify its distinctive character – a spinning cylinder with its interior wall equipped with two sets of riffles – one set of longitudinal riffles running its entire length, and at right angles to them a second set of riffles forming annular rings around the wall.The simplest horizontal centrifuge is a scrubber-centrifuge – a scrubber rotating so fast the material is not only scrubbed but also spun so fast it attains a significant degree of density classification. Some scrubbers may unwittingly be centrifuges. 7.5ft long 20-inch diameter cylinder, with six 1.75-inch high longitudinal riffles and four 2-inch high annular riffles, rotates at 128 rpm and processes 20 tons/hour (10m3). The Gekko TM in-line pressure jig (IPJ) was invented by Alexander Gray of Victoria who was awarded patents in1995 in Australia (AU #W095/26,232) and 2000 in theUSA (US #6,079,567). 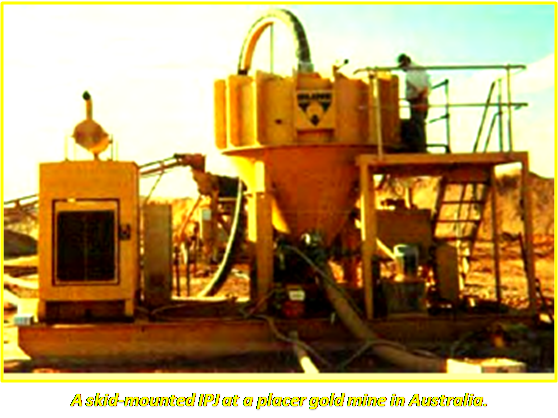 The innovation was intended for recovery of low-grade high volume placer gold; later for hard rock grinding circuits [174-178]. A slurry pump drives the entire system. Then egligible pressure drop ensures a 15-metre head to pump tailings up to a settling area, and allows jigs to bear ranged in series if so desired. The IPJ has a moveable, rather than fixed, jig screen. The operator can dictate the height the jig bed rises and falls; and all particles are raised to the same height regardless of particle density. Jigging is a sawtooth pulse rather than simple pulse, andthe operator can select the upstroke and downstroke speeds independently, as well as adjust the stroke duration via electronic control of the hydraulic drive.The jig is very compact, treating up to five times more for same area of jig screen. The trommel or shakingscreen can be low as the slurry is lifted to the jig by slurry pump. Water demand is lower than for most other jigs. The maximum feed for a standard IPJ is 25 mm –remarkably large. The slurry is pumped along a feed pipe into the top of the jig. Entering the distributor, the slurry is turned around upwards to spread out in the deceleration chamber. The jig is pressurised, sealed, and completely filled with water and slurry. The lack of a water surface is a deterrent to flour gold floating away. The spreading motion, and unimpeded large circular area available for it, causes the slurry to slow to a velocity incapable of holding so much suspended solids. So the ‘heavies’ drop towards the jig bed and are trapped in the separation interface on the top of the jig bed. The jig bedis pulsed by a central drive shaft driven by the centraldrive ram at the unit’s base. The pulsing achieves episodic ‘quicksand’ (thixotropic) conditions.During the dilation phase, gold separation occurs bydensity, plus segregation by differences in size and shape. In the suction phase, heavies are drawn through the ragging and screen to fall into the hutch – drawn off by aspigot as a continuous discharge. Nuggets stay on the jigscreen awaiting batch discharge. The ragging is a 25mmthick carpet of lead shot covering the 2-3mm holes of the jig screen. The IPJ 1500 uses about 200 kilos of lead shotand Gekko has begun making ‘synthetic’ ragging.